Claude Poullart Des Places & Francis Mary Libermann. 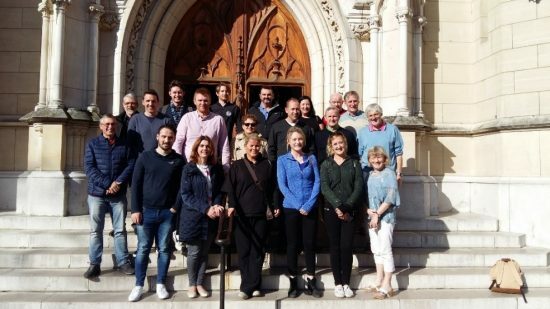 In the Spiritan Education Trust there is a sub-committee set up to advance and support the ethos of the Congregation of the Holy Spirit in Ireland. Each Irish Spiritan school has appointed members of its staff to represent it on the sub-committee. Within this sub-committee, a number of initiatives have been explored recently, including an induction for all new members of staff who join the Spiritan tradition. It is through this Spiritan tradition that staff will get to know the historical journey of the Spiritan Order and come to understand how the seven core values of the Order are lived out daily. Another initiative organised by the sub-committee and completed over last weekend was a pilgrimage to the Motherhouse in Paris to walk in the steps of the Spiritan founders, Des Places and Libermann. 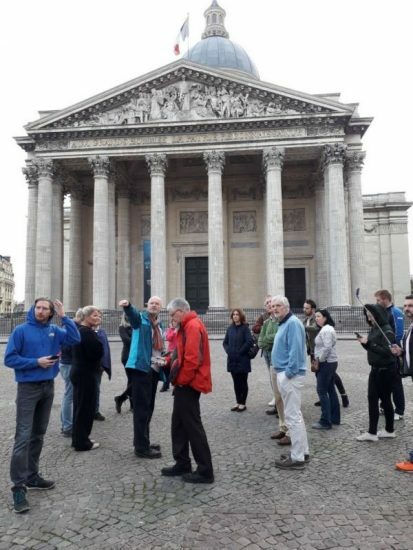 The pilgrimage brought together in community staff members from Spiritan schools to pray, reflect and take in the sights of the Sorbonne district and the wider Paris area. The staff members who went included representatives of Blackrock College, Willow Park, St Mary’s Senior& Junior schools, St Michael’s Senior & Junior Schools and ourselves, Rockwell College. We were accompanied by Tom Sheridan and Tom Jackson of the Spiritan Education Trust, led by Ronan Barry and guided by the Irish Provincial leader, Fr Marc Whelan CSSp. It was an early rise on Thursday morning for all travellers with Terminal One in Dublin airport as the first destination. The second was Charles de Gaulle airport in Paris arriving there around lunchtime. 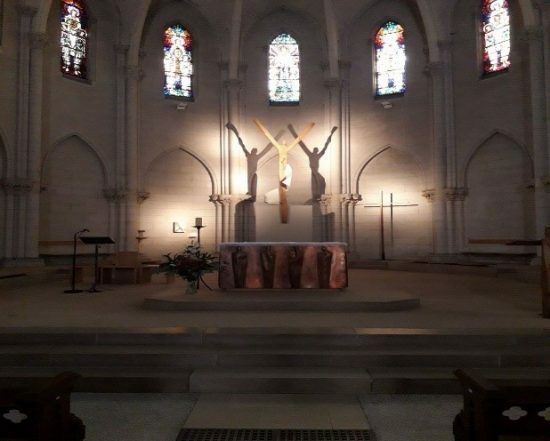 We were duly despatched into various taxis and driven through central Paris to our residence for the weekend – 30 Rue Lhomond, 75005, Paris, the home and Motherhouse of the Congregation du Saint-Esprit. We were greeted by the French Confreres and then we sampled our first French culinary meal of the weekend which was most welcome after the journey. As pilgrims we had time that first afternoon to visit the famous Sacre Coeur followed by a stroll around Montmatre. On Friday morning we had a guided visit to the Orphelins d’Auteuil and the Chapelle de Sainte Therese. This is a foundation, under the patronage of the Spiritans, for children facing a broad range of challenges. Fr Xavier was the Spiritan who conducted the tour including the historical origins of the foundation. Unlike Ireland, in France Spiritan involvement in schools is minimal. Yet this Auteuil Centre of Education offers opportunities to teenagers who have had difficulties with their families, their communities and with the law. Here they have possibilities to learn practical skills like for example electronics, and within the campus, there is a Catering School where the students learn restaurant & cooking skills. 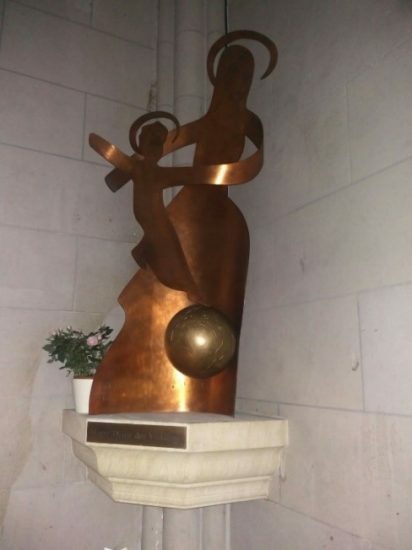 It certainly captures the core value of the Spiritan Order of “Option for the Poor!” A lady called Sybil, who works in this Spiritan Administration Centre, gave us a presentation on “Apprentis D’Auteuil.” Scattered around the whole of France there are 200 other centres. The website is www.fondation-auteuil.org if you require more detailed information. We had lunch with the leaders of this administrative centre followed by a visit to the Chapel of St Therese where we had a small prayer service near the tomb of Blessed Daniel Brottier CSSp. He was instrumental in the growth of this project which started off bringing young boys who were begging on the street to form a community where they could learn new practical skills. We were free to visit Notre Dame Cathedral where we had more time reflecting in the peace of this splendid place of worship. Then we went back to see Sacre Coeur by night and soak in the atmosphere around this area and see the stunning view of a Parisian autumnal evening. Day two complete. Saturday, our third day, began with a walk around the Sorbonne University with our first stop at the Pantheon, a magnificent building which was formerly a church, yet despite having religious symbols, is now the heart of secular France, where those who famously contribute to French culture can be interred there. Our tour was led by Fr Jean Pasqual CSSp who is responsible for those students involved in priestly formation and vocations in the French province. We followed in the steps of Claude Poullart des Places by going to the church of St Etienne de Monde where we saw a plaque in this church dedicated to him as he was interred here. Claude, from here, started the formation of students who after ordination were sent on missions, to work for and with the poor. In this church, too is the tomb of St Genevieve, a famous French saint. We also visited two houses that Des Places bought for this purpose, the second a larger house, he lived in for two days before dying at the tender age of thirty. This part of the pilgrimage continued with a visit to the room in the Motherhouse of the second founder Francis Libermann and then with a visit to the adjoining chapel for a prayer service led by Fr Marc and with contributions of readings, prayers and hymns from all the schools. At 6pm we went to the Church of St Gervais to join the Monastic community of the Fraternités de Jerusalem for vespers. This was a beautiful, reflective, uplifting liturgy by a mixed male and female community who sing the psalms and prayers in a Gregorian, Taizé-like manner. We then walked from there back to a restaurant near to where we were staying and dined together eating all sorts of French delicacies from mussels to frogs legs to snails washed down by delightful vin rouge et blanc!! On Sunday morning we joined the community for Sunday Eucharist. A special mention was given to the Irish Spiritan Educators by the main celebrant who invited us to a Spiritan community reception and aperitifs. This was followed by a delightful lunch where we then had a few words of thanks for the hospitality received by us and small presentations were made to the community to show our appreciation. There were a few hours on Sunday afternoon to visit other famous sacred Parisian sites. Rue de Bac is where the Church of the Miraculous Medal is situated. The chapel is where the Blessed Virgin Mary appeared to Saint Catherine Laboure in 1830 and requested the creation of the medal which came to be known as the Miraculous Medal. Also a visit to St Sulpice church, mentioned in Dan Brown’s novel The DaVinci Code where our Founder Libermann would have prayed as a seminarian at St. Sulpice. A little shopping at Les Halles de Chatelet to pick up family gifts and a final stop at Contrescarpe square to sip café au lait and be entertained by street buskers while watching the world go by brought this pilgrimage to its near conclusion. We packed up at the Motherhouse and walked with suitcases on tow to Places de Luxembourg Metro station where we got on the RER straight to Charles de Gaulle airport. Our flight departed on time arriving in Dublin at 10.30pm. It was then time to say our goodbyes to our fellow Dublin based Spiritans before journeying back to the golden vale of Co Tipperary.